If you mess up in the beginning, it’s probably not going to end well. That statement is true about a lot of things. For now, we’re going to focus on Facebook Advertising. As a former Facebook employee turned Digital Marketing consultant, I’ve seen my fair share of successful and unsuccessful campaigns. Often, the difference is simply hitting the correct button from the beginning. When setting up a new Facebook ad campaign, the first step you are required to do is choose your Campaign Objective. The objective is what you want people to do when they see your ads. Your selection will affect targeting, optimization options, and ad types. For example, if you select the “Traffic” objective, your default bid will be cost per click, and Facebook will try to get you as many clicks as possible, at the optimal price. Notice I said Facebook will try to get you as many clicks as possible, I didn’t say anything about conversions. We’ll get there shortly. You can only choose one objective per campaign. Meaning, you better get this right. However, this is where I see many advertisers struggle. As a result, their campaigns underperform, and they end up spending a lot of money in the wrong direction. Beyond that, I see them waste time trying to ‘fix’ other campaign aspects, such as their targeting or ads. When auditing these campaigns, my conclusion is often something along the lines of “Oh, you hit the wrong button”. Meaning, you selected the wrong campaign objective. I then head back to Brooklyn and come back once you’ve had a chance to redo your campaigns. You can learn more about the Audits I offer here. Let’s break down these Objectives so we can get it right from the start. Objectives are categorized as Awareness, Consideration, and Conversion. While that’s vaguely beneficial, we’re going to get much more granular. When choosing an Objective, your ad delivery will be optimized to reach people who are more likely to perform your intended action. However, you can still add targeting, such as an interest. The Facebook algorithm will then deliver your ads to people who are more likely to perform your intended action and fit your targeting criteria. As a result, you could have 1000 people in your audience, but reach a much smaller number, based on how Facebook thinks each person will respond to your ad. In the example below, my target audience is people who like Biking. My ads will be delivered to the subset of people who like Biking and are more likely to perform my intended action. The size of the dot is just an example. It could be much bigger or smaller based on your goal, audience and engagement. Now that we have that established, let’s go through all the available Objectives. When choosing Brand Awareness as the campaign objective, your campaign is optimized to reach people more likely to recall seeing your ads. This is measured by ‘Estimated Ad Recall’, which is an estimate of how many people are likely to recall seeing your ad if asked within 2 days. Estimated Ad Recall is determined by both audience polling and machine learning. When should you use Brand Awareness? This is a good fit if you just want to spread the word about your brand, but aren’t immediately focused on getting traffic or conversions from your ads. However, you most likely won’t be able to reach everyone in your audience. Reason being, the algorithm will deliver your ads to people who are more likely to pay attention, based on numerous signals. You may be better off with a Traffic objective (which I’ll explain shortly). The Traffic objective is optimized to reach people who are more likely to click, and Brand Awareness can be a byproduct of their visit. With Reach ads, Facebook will optimize for the highest number of possible impressions, without any consideration of clicks or actions taken by your target audience. While this sounds very similar to Brand Awareness, delivery will not take Ad Recall into consideration, which will allow you to reach a larger audience. When should you use Reach? Reach ads are a good way to make sure the largest percent of people in your target audience will see your ad. A great use case for this is remarketing. Meaning, serving ads to past visitors or buyers. Since they’re already familiar with your brand, they may be more likely to engage with your ads, regardless of what the objective is optimizing for. However, you’ll want to make sure you’re target strong intent signals. For example, people who have added an item to their cart, and not completed the purchase. This is also a good use case for local advertisers who just want people to know they’re in the area. For example, a new Dentist office opening in Brooklyn. It’s safe to assume most people who see your ad don’t have a toothache, but hopefully they’ll think of you next time they need your services. Traffic - Increase the number of visits to your website, app or Messenger conversation. By choosing this objective, your campaign will be optimized to show your ads to people who are more likely to click on links. For example, a link to your website. However, they aren’t necessarily going to take any other action once they get there. When should you use Traffic? Choose the Traffic objective if your main goal is to get people to click your ads, with no specific action after they click. Sure, it would be great if they did something, such as make a purchase. But that’s not the primary goal of this objective. Instead consider using this to get more views for your blog, or provide some sort of value before asking for a conversion. You can then remarket to them later by creating Website Custom Audiences. These Custom Audiences typically get more engagement, which can aid in getting conversions. Get more people to engage with any of your page posts. This can also be done by clicking the “Boost post” button from your Facebook page. However, you get more options if you do it through the Facebook ad platform. With post engagement ads, Facebook will show your ads to people who are more likely to click, like, share and comment on your post. When should you use Post Engagement? This is a good option if you’re ok with getting ANY kind of engagement with your post. However, if your goal involves sending traffic to your website, you’d be better off going with the Traffic objective. A good use case would be encouraging User Generate Content. For example, a local gym with a post that says “What are some of your favorite songs to listen to while you work out?”. There’s no wrong answer, unless someone mentions Enya. With this objective, your goal should be to get more people to like your Facebook page. Please note, these ads don’t include links to your website. When should you use Page likes? This is only useful if you want more Page likes. Other than that, there’s probably a better objective to use. Reason being, this objective optimizes towards people who are ‘Likers’. Quite often, these individuals don’t provide value to your overall business. Beyond that, most people who like your page won’t see your posts in the News Feed, so you’d need to pay to promote your content either way. That said, Likes can be a way to gain Social Proof. For example, if that Dentist office I previously mentioned only had 13 likes, it may cause some people to look for other options. Facebook Page owners can create and promote events with ads that are optimized towards getting more people to respond. This isn’t mandatory, but it’s a great way to spread the word among your target audience. When should you use Event Responses? Use this objective to get more responses for your event, if you’re not getting enough traction organically. I recommend capturing contact information for anyone who has expressed an interest in attending. For example, providing a link to an Eventbrite page on your event page. People may forget they expressed interest, this will give you another opportunity to reach them on a different channel. When you want to boost sales in your stores or online, a discount or promotion is a great way to get people's attention and encourage them to act. With Facebook offer ads, you can create and extend timely discounts and promotions to the people you want to reach and encourage them to shop. How to create an Offer. When creating an Offer claims campaign, the option to create an offer is a part of the Ad Set creation process. Choose the type of offer you wish to promote – It can be a percent off, amount off, buy one get one, or free stuff. When should you use Offer Claims? This is a great option if you would like to promote a timely discount, and generate a direct response. People who claim offers will also get notified when the deal is about to expire, so they use it in time. App Install Ads help you connect with the people who are more likely to install your app. The ads link directly to your app page on Google Play or the App Store. Please note, you must have the Facebook SDK installed on your mobile app, and have your app listed on Facebook. You’ll want to connect with your app developer to complete this process. When should you use App Installs? Pretty much anyone who has a mobile app. Outside of organic installs, Facebook is typically the most efficient and cost-effective ways to get app installs. With App Analytics, you can even discover what segments are more likely to perform success events after they install. This allows for enhanced targeting, and increases the value of your acquisitions. I prefer to use this in conjunction with a retargeting audience. Encouraging someone to install your app on their phone is a pretty big ask. You may be better off sending them to your website with some sort of value added content, then retargeting website visitors. When choosing video views, your campaign will be optimized to get as many 10+ second video views at the best possible price. When should you use Video Views? Use this objective to promote videos that show behind-the-scenes footage, product launches or customer stories. This is often a great way to engage a passive audience with content and encourage them to take some sort of action. That said, you should always include subtitles, give people a reason to turn the sound on. You can also create a Custom Audience of people who have watched your videos, to a specific percentage. This is a great way to create a retargeting audience of informed prospects. Lead generation – Collect more leads, such as email addresses, from people interested in your brand or business. Lead ads allow you to capture a prospects contact information directly from the Facebook News Feed, without visiting your website. 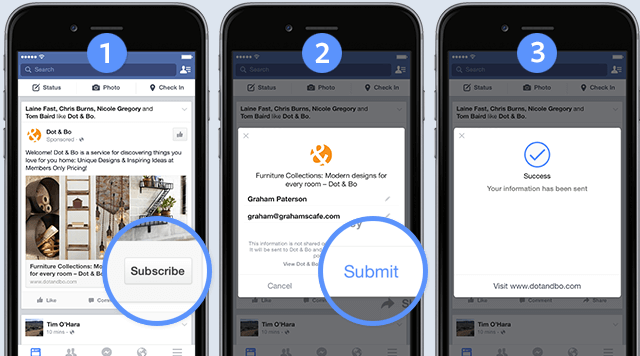 By clicking your lead ad, customers will see a form that’s already filled with info they’ve shared with Facebook—like their name, number, or email. When should you use Lead Ads? Lead ads can have a higher conversion rate than landing page conversion rates. This is especially true if you have a slowly loading landing page, or UX challenges on your website. Generating leads may be a better option if you have a longer sales cycle, or a product/service that requires onboarding from a sales team. Lead ads are effective at getting leads, but the quality of these leads can vary. Be sure to gauge the impact of these leads, and consider using a conversion based objective if need be. Additionally, I often use these in conjunction with retargeting audiences. This way, you can serve Lead ads to individuals who have already exhibited interest in your business. Messages - Get more people to send messages to your business in Messenger. Using this objective, a click on your ad will open a conversation in Messenger. They’re also optimized to reach people more likely to reply to your business, helping move customers from consideration to action. When should you use Messages? The messages objective drives conversations to your business which you can use to generate leads, drive transactions, answer questions, or offer support. As per a Facebook study, when it comes to communicating with a brand, 54% of US social media users said they preferred messaging channels, including Messenger, over email, phone and online chat. Conversions - Drive valuable actions on your website or app. This could easily be one of the most impactful objectives. Conversions ads are aimed to increase sales, sign-ups, purchases or any other desired action on your website. After you select your targeting criteria, the Facebook algorithm determines who is more likely to perform these events. Please note, this option is only available when you have the Facebook pixel installed on your website, and you have defined your specific conversion actions. The Facebook algorithm works well, but it can require around 30-50 conversions a week to function properly. For example, if you’re optimizing for a ‘Checkout’, but you only get a few sales per day, this objective may underperform. If this is the case, try using a lower level conversion with a higher number of conversions like ‘Add to cart’. Just because someone is in the Conversion audience, it doesn't mean they're going to buy everything they see. You still need to provide value in exchange for their attention and action. I often recommend using the Conversion objective as the second part of your overall acquisition strategy. For example, use the Traffic objective to direct your audience towards valuable content, such as your blog. Then, use the Conversion objective to retarget those individuals with a clear call to action. Catalog Sales - Create ads that automatically show items from your catalog based on your target audience. The Catalog Sales objective allows you to create Dynamic Product Ads (DPAs). These ads look exactly like other single image ads or ads created in the carousel format on Facebook, Instagram and Audience Network. However, instead of individually creating an ad for each of your products, you create an ad template that automatically uses images and details from your data feed for things you'd like to advertise. Dynamic ads use your Facebook pixel or SDK to show ads to people who have already shown interest in your business by taking actions you care about on your site. These are a great fit for eCommerce advertisers that sell a variety of products. You simply need to upload your product catalog and set up your campaign one time. It will then continue updating your ads for as long as you want—finding the right people for each product, and always using up-to-date pricing and availability. This is a huge time saver for eCommerce advertisers, you only need to create a template as opposed to several ads. For my clients, these are often the most efficient way to get conversions. Store Visits - Get more people nearby to visit your brick-and-mortar locations. As the name implies, the Store Visits objective is for brick and mortar businesses. This objective lets you target people within a set distance of one - or many - of your store locations with ads designed to help people navigate to or contact the location closest to them. Please note, Store Visits optimization and reporting is available to a limited number of Facebook clients. Like I said at the beginning, this is often where I see advertisers go astray. However, these are not hard and fast rules. For example, I’ve seen the Video View objective get conversions at a more efficient rate than the Conversion objective. My goal is to give you a good place to start, you can then start experimenting from there. The ‘right’ objective is always based on your Goals and Key Performance Indicators (KPIS), so you’ll need to establish those first. Once you start to collect data, you can optimize based on performance. Need some help? Check out my Digital Marketing Campaign Optimization post. You’ll learn the basic concepts, and I included links to a few hands-on exercises. Need a second set of eyes for your campaigns? Learn more about the Audits I offer.